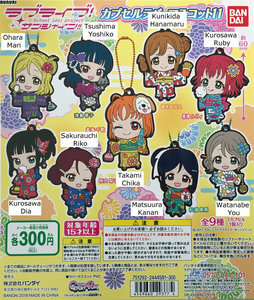 Ohara Mari, Tsushima Yoshiko, Kunikida Hanamaru, Kurosawa Ruby, Kurosawa Daiya, Sakurauchi Riko, Takami Chika, Matsuura Kanan or Watanabe in a very cute outfit and is approx. 5.5-6 cm tall. Notice: The color of these straps on the picture can slightly differ with the real ones because of camera (lighting effects). The capsule is not included when the strap is shipped in a cushioned enveloppe or a mail box.